This award winning piece is the inaugural chair design by Fernweh Woodworking. The frame is hand-shaped from high quality American Walnut, providing rich warm brown tones with sleek joinery inspired by Danish, Scandinavian, and mid-century modern design. 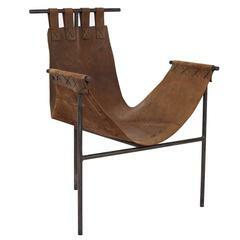 Slung with high quality, comfortable, hand-stitched black leather, this chair will make a statement in any room. 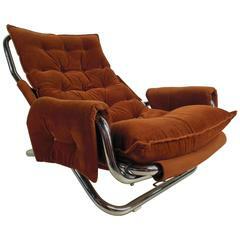 An excellent accent lounge chair for your living room. This design won two awards from the Oregon Chapter of the International Interior Design Association's 2017 Design Excellence Awards. It won Best in Category: Maker, and also the People's Choice Award. Dimensions: 34" deep, 27" wide, 35" high. Front cross bar is at 16" high and 20" wide, and the armrests are 23" high. Justin Nelson started Fernweh Woodworking in 2015. He calls his role "Designer/Craftsman" and cherishes both the woodworking and design elements of the company. A former Marine Officer, Justin has a bachelor's degree in business from Purdue University, and is a self-taught woodworker. He is inspired by the design philosophy and work ethic of Sam Maloof, and admires the legacy and designs of Hans Wegner and the Eames, among many others. "I'm just a baby woodworker and designer, and to some extent I hope to always feel that way; no matter how much you learn, you should always be overwhelmed and excited by the oceans of things yet to be discovered. I hope to do my small part to keep the craft of woodworking not only alive, but fresh." Black leather diamond patterned lounge chair in walnut. New black leather. Very unique and unusual chair. Refinished and refurbished. Measures: Seat height is 16 inches.